When the rainy season comes to the Indian plains and the monsoon settles on the Bengal region, people stuck inside their homes yearn for the taste of home-made tel muri. 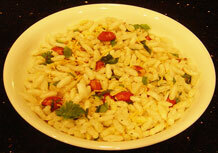 It is a common street food and a light snack of seasoned puffed rice mixed with peanuts and vegetables. 1) Split the cocoanut in two and drain the cocoanut water. Even though the water isn’t used for cooking keep it as a refreshing drink. Strip out the white cocoanut meat and remove the brown outer layer. 4) Add oil to a moderately hot pan, then drop in the peanuts and stir fry them until the peanuts take on a golden-brown hue. 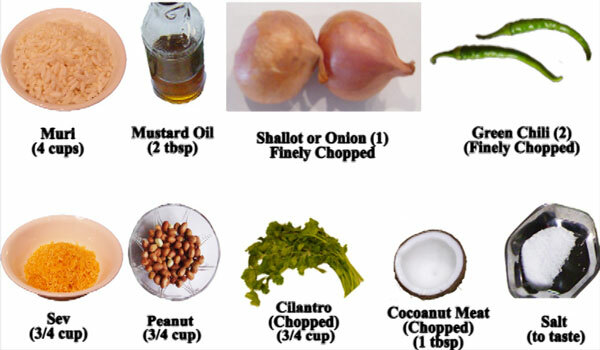 6) Put cups of crispy Muri in a large bowl, add mustard oil, shallots, chilies, sev, peanuts, cilantro and cocoanut. 8) Serve fresh so it doesn’t get soggy!